Calisthenics is a great way to gain strength and get fit, and because you don't need a gym you can easily workout in various places and at no cost. Calisthenics workouts can be quick and simple, they can target a specific move or muscle-group, and they can be done alone or with friends. The freedom is yours! Below are a few workout ideas to try. Have a go and don't be afraid to put your own twist on them. Don't forget the key is to adapt them to your goals, so make sure you change up the reps/exercises to get the most from your workout. 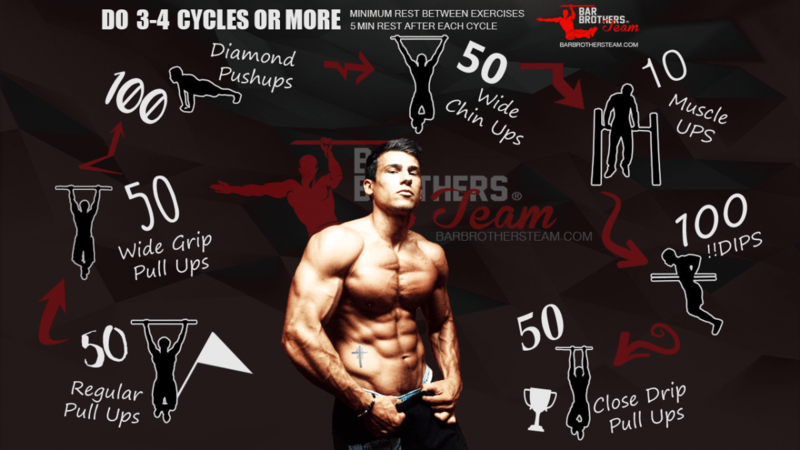 For this exercise you want to pyramid set the the dips and pull-ups, starting at 10 and working your way down to one. You can make this easier (or shorter if you're tight for time) by starting from a number lower than 10, so work within your own limits by choosing a starting rep number which allows you to finish the sets. Take 30 seconds to 1 minute between each set, with a 3 to 5 minute rest between each cycle. Aim for 3 cycles. This one is great for a quick workout at home since it's solely press-ups. Simply choose any 8 press-up variations from this list and perform either 10, 15 or 20 reps of each set with only a little rest between sets. Mix it up to keep it fresh and of course feel free to add other press-up variations as you wish. A personal favourite of mine, and one that's going to introduce you to some of the toughest three and a half minutes of your life! Note: This challenge has been moved to it's own post. Check out the "Bring Sally Up" Challenge here.